Even though Charlie Chan (Sidney Toler) tells his client that he’s a detective instead of a magician, he does admit to believing in the ancient Chinese proverb that “one small wind can raise much dust.” And that he does in trying to help a young woman clear her father’s name before he’s slated to be executed for a crime she swears he didn’t commit in roughly one week’s time by raising dust and dusting off the alibis of a hotel filled with an awful lot of coincidences and shady characters along with the aid of the Chan films’ loyal but inept comic relief, Number Three Son (Benson Fong) and Birmingham Brown (Mantan Moreland). Warned that he’s staking his reputation on a case that may not be on the level, Chan soldiers on, even after he’s shot at by an unknown figure that warns him he may actually have been on the right level all along; meaning the life of an innocent man is hanging in the balance in this less than involving yarn that wears thin long before its approximately sixty minute running time is up. While it’s slightly excruciating to sit through some of the racial stereotypes embodied not only in Scottish American Toler’s yawn-inducing delivery of dialogue but particularly in the treatment of the African-American Moreland who’s used primarily for cheap laughs, it’s to your benefit to try and look past the dated characterizations if you plan on seeking out TCM’s latest Spotlight Collection set of four previously unreleased DVDs. And although the quartet of titles are best suited to enthusiasts of the character first crafted in 1923 by author Earl Derr Biggers, viewers are sure to enjoy Money a bit more than the snooze worthy opener as Toler’s Chan, Number Two Son (Victor Sen Young) and Chattanooga Brown (Willie Best) stumble onto a complicated case while aboard a luxury ocean liner. 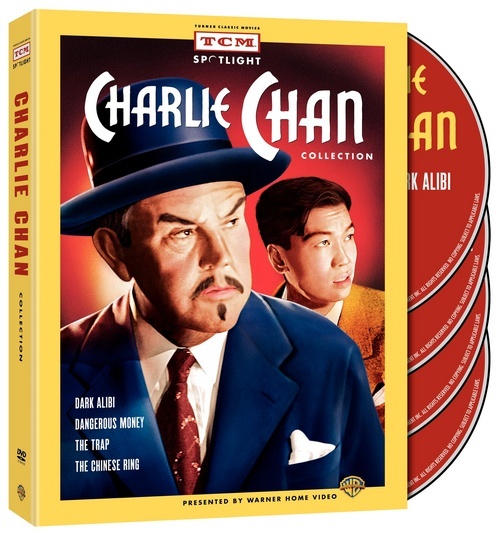 Having had two attempts made on his life before a third one is carried out while he seeks out Charlie Chan, a US Treasury Department officer leads the world famous Chinese detective into a web of murder and hot money that comes full circle when a murderous stabbing takes place in the ship’s salon, just after the cruise’s knife-throwing act finished up. Picking up the trail that the deceased officer had been investigating, Chan finds the roomful of guests voyaging to Samoa to be none too forthcoming with the truth and all too happy to vouch for one another when Chan and his assistants grow suspicious. Benefiting from its claustrophobic setting and Agatha Christie like set-up of a ship-bound parlor mystery, Money still isn’t entertaining enough to recommend it on its own but makes for a passable inclusion in this lackluster set. While his rapid decline in health was apparent onscreen in Dangerous Money, the superior entry The Trap marked Toler’s farewell to the character he’d portrayed for nearly two dozen titles and two studios as the last Chan entry completed before the actor’s death. Similar to the previous case, The Trap also specializes in presenting us with a large amount of suspects all with shocking secrets who fear that “there’s a plot against all of us,” as the killings begin among the community of beauties. Relying more heavily on his two assistants portrayed by Sen Young and Moreland who do double duty as both comic relief and slightly more helpful sidekicks to the detective, the movie finds the trio brought in to foil a murderer by an urgent plea from an Asian member of a showgirl company, staying in a spooky old house down by the ocean in Malibu. Filled with screaming and darkness and Chan’s unique ability to whittle away at the little white lies that fill the characters’ alibis, it’s a strong final showing for Toler that offers audiences plenty of distractions from the standard formula. Although the future of the series was jeopardized following the death of Toler, who’d bought the rights to Chan when Fox ceased production and later sold the rights to the lower budget studio Monogram Pictures, from the modern perspective of someone viewing the remastered titles today, the debut of actor Roland Winters as Charlie Chan in The Chinese Ring easily surpasses the previous three films in both characterization and quality. While Toler’s health had perhaps affected the delivery of the dialogue to its most sleep inducing rhythms in this collection’s opening duo of titles and therefore don’t provide us with an accurate picture of his skill as an actor, Winters performs Chan with far more spirit. Given an outstanding jolt at the opening of the picture as a lovely Chinese princess is gunned down through the window of the detective’s apartment while waiting for Chan, the audience along with Winters, Young and Moreland are in for another surprise when a tablet reveals that with her last dying breath, the princess had managed to scribble out part of a name that may lead us to the triggerman. Working in tandem with a local San Francisco police sergeant who finds his journalist girlfriend waiting for him at the sight of every next clue, Chan must brave the seedier side of Chinatown in the film that also benefits from multiple locations and a stronger sense of authenticity than its more shut-in, stagey predecessors. And although I wish that we’d been able to see Toler in much better condition at his peak as the beloved detective, for the curious classic film buff it’s certainly of interest to seek these out if only for the benefit of exploring a legendary series rather than being impressed by their quality as films. Namely, despite the polish in picture and audio, there’s no hiding the fact that as they stand, they’re just not that great but The Chinese Ring is more tolerable than the rest.